Wingstop announced positive comps for the 25th consecutive quarter, dating back to July 2003. Wingstop ended its most recent quarter with a 1.6 percent increase and is up 3.8 percent for the year. The company predicts the positive trend to continue into the fourth quarter during the football and holiday seasons, when its sales are typically strongest. 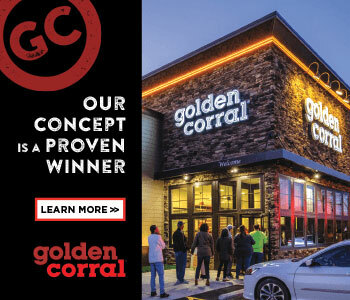 "This news is strong evidence that limited-service chains continue to deliver value during a difficult economic climate," said Darren Tristano, executive vice president of Technomic, Inc., an industry research firm. Wingstop, founded in 1994 and franchising since 1997, has 425 restaurants open in 34 states. Buffalo Wings & Rings has opened two new family-owned locations. In Cincinnati, husband-and-wife team Alan and Amal Alsabbagh operate a counter service variation of the brand's fast-casual concept in the city's Northgate Mall. The second new unit is in Portland, Ind., where farmers Jim and Vicky Lochtefeld, with their three sons, began a week-long grand opening in early November. Founded in 1988 in Cincinnati, the brand has about 50 units open and another 50 under contract that are set to open this year and next. Through an agreement with Sodexo, WOW Café and Wingery has opened eight campus locations in 2009 and plans to open two more by year-end. In addition, WOW opened 11 non-campus locations this year, its newest in Warner Robins, Ga. Launched in 2001 by brothers Paul, Steve, and Scott Ballard, WOW has 53 locations in 21 states (16 on college or university campuses), with four more under construction. Based in Covington, La., the brand expects to reach 75 units in 2010. PJ's Coffee of New Orleans has announced expansion on several fronts. The brand was acquired by local owners in June 2008, when Raving Brands sold its 44 corporate and franchised stores to Scott, Steve, and Paul Ballard, along with Thomas Richards, Brett Pearson, and Mark Higdon. Today PJ's has 63 locations in 7 states, with 12 more set to open in the next 6 months. The new owners also negotiated a two-year partnership with the New Orleans Saints that includes PJ's designation as "the Preferred Coffee of the New Orleans Saints" - and the rights to brand two of the Superdome's outside air handling units to mimic giant coffee cups, complete with steam rising out of them. On the retail front, the brand, which already offers PJ's branded bottled spring water, is finalizing plans for a ready-to-drink beverage. PJ's Coffee was established in 1978 and began franchising in 1995. Sports Image, a high school sports marketing brand, recently awarded its third franchise, to Bill Wood of Palm Bay, Fla. Its two other franchisees are Eli Rose in Atlanta, and Scott King of Huntley, Ill. "We've been in business for 8 years helping schools and organizations, but just recently turned our model into a registered franchise opportunity," said Eric Horstman, company president. "We are on pace to have 15 franchises operating across the country by the end of next year." Sports Image was founded in 2003 in Franklin, Ohio, and began franchising in May 2009. Fast Wrap USA has signed an area development agreement for the entire western side of Florida, including Orlando, with the first franchise set to open in early November. This is the brand's fourth AD agreement, with each averaging six to seven locations. Fast Wrap vans provide mobile shrink wrapping to weatherize and protect RVs, boats, farm products, shipping containers, weather-damaged structures, and more. The Reno, Nev.-based brand has sold 37 units so far in 2009, its second year of operation. Two new Seniors Helping Seniors franchises have opened, one in Sacramento County, Calif., and one in Gwinnett County, Ga. The brand matches seniors who need in-home care services with seniors who provide them. "We believe we have found a practical, cost-effective way to help seniors remain independent and to continue contributing," said co-founder Philip Yocom. The franchise has 10 regional owners and more than 80 franchisees in more than two dozen states. Embassy Suites Hotels has opened two new hotels - in Atlanta and in Houston - based on its Design Option III Prototype. The Atlanta hotel has 192 suites, and the 14-floor Houston hotel has 216. Both have about 7,000 sq. ft. of meeting space. According to the company, these models are more cost-effective, environmentally friendly, and its suites have a more residential feel than previous designs. "Roughly 75 percent of Embassy Suites' development pipeline of 54 hotels is the Design Option III build," said Jim Holthouser, global head of full-service brands, Hilton Worldwide. Founded in 1984, Embassy Suites Hotels (a Hilton Worldwide brand) have 201 hotels, with an additional 49 in the pipeline. Dhavel and Hetal Patel, who own and operate 7 Dunkin' Donuts in northern New Jersey, have signed a master franchise agreement to open more than 20 Freshii restaurants in New York City. They expect to open their first Freshii by early 2010. "There is obviously a huge trend towards healthier eating and we had to figure out how to intelligently expand our franchise holdings in that direction," said Hetal Patel. Freshii, which started in Toronto and is now headquartered in Chicago, has opened 16 restaurants in the U.S. and Canada and has another 100-plus in development in New York, Chicago, Washington, D.C., Colorado, Los Angeles, and Eastern Europe (see below). Camp Bow Wow has opened three new doggy day and overnight camps: in Naples, Fla., Rockland County, N.Y., and southwest Dallas. Based in Boulder, Colo., Camp Bow Wow began franchising in 2003 and has sold more than 200 franchises in 38 states, plus one in Canada, with more than 100 open. With 25 percent growth expected this year in the U.S., Right at Home, which provides in-home companion and personal care assistance to seniors and disabled adults, has begun its international expansion with the addition of its first master franchise in the United Kingdom. Ken Deary who will open the initial location in Preston, England, is a past McDonald's franchisee, and received The Golden Arches Award in 2001. He also was named Franchisee of the Year by the British Franchising Association. Based in Omaha, Right at Home has more than 165 local franchises in 41 states. "Culturally, the United States and the United Kingdom are somewhat similar. The potential for growth is tremendous," said Allen Hager, founder and president of Right at Home. RosKo Fitness, Inc. has signed a multi-unit deal to operate Koko FitClubs in the Ontario area. Its first club is scheduled to open outside Toronto in Oakville by year-end. "We were looking for a retail business and were intrigued by Koko FitClub's potential to be a game-changing fitness industry leader for millions of Canadians," said Tony Rossi, RosKo partner. Koko claims its technology allows clubs to be run by one person during daytime hours and be operated in no-staff, self-service mode during off-peak hours, without any difference in service levels to its members. The franchisor (which calls itself a technology company) also claims to have invested nearly $10 million since 2003 to develop its patented Koko Smartraining System, which it says will provide the benefits of a 60- to 90-minute personal training session in 30 minutes or less. Andreas Kotal, owner of Salad Room, Vienna, Austria's first fast casual salad concept, has entered into a master franchise agreement with Freshii to convert his existing restaurant to Freshii and expand the Freshii brand throughout Eastern Europe. Matthew Corrin, CEO of Freshii, said, "I was in Europe last week and amazed how little organized competition there is in Europe compared to North America, and we can't wait to start opening new Freshii restaurants throughout Europe." Kotal, a serial entrepreneur, first saw Freshii in Toronto where he operates Canada's largest fleet marketing company, CityFlitz. Freshii has enlisted the help of Fransmart to aid in its overseas expansion. Krispy Kreme Doughnuts plans to open 14 shops over 5 years in the Dominican Republic through a development agreement signed with Dominspec, S.A., which already operates Burger King and Papa John's restaurants in the country. Of Krispy Kreme's approximately 550 stores worldwide, more than 80 percent are now franchised, with 60 percent in 18 countries outside the U.S. The company also announced a franchise development agreement for China. Want to be in FUSR's Winner's Column? Send us your news of new openings, expansion, financial success, international growth, and any other solid indications of growth to: editorial@franchiseupdatemedia.com.